food for scot: Grilled Pizza! We have become lovers of grilled pizza. YUM! Several people have recommend it to me. And we finally gave it a shot. 1. I am over heating up the oven to 500 degrees in our non-AC'ed apartment. Dumb! And hot! Jk, I will probably still did it when I forget how much I hate it. 2. Grilling pizza takes WAY less time than baking it. 3. It tastes so good. It gets nice char marks. Blackened. 4. After failing, we figured out a few good tips for doing it right. First, you want to make smaller pizzas. I would keep it to about an 8 inch diameter circle (or the equivalent for whatever shape you make). Personal pan style. Big pizza is hard to manhandle on the grill...flipping it and all that. Next, how to grill it. Oil the grill and over a medium heat, lay the rolled out dough (naked) over the flames. Let it cook for about 1-2 minutes until it has nice marks. Flip the dough over and cook until the raw dough hardens up slightly (about 1 minute). You just want it to not be sticky anymore so you can easily slide it on and off a plate. Take crust off the grill. Now, top the crust with whatever you like. Everything should be pre-cooked, since it will just be warmed up. Then, slide the complete pizza back on the grill, close the lid, and cook until everything is melted and the crust is cooked through (about 5 minutes). You may want to turn down the heat so the toppings have enough time to heat up before the crust is done. 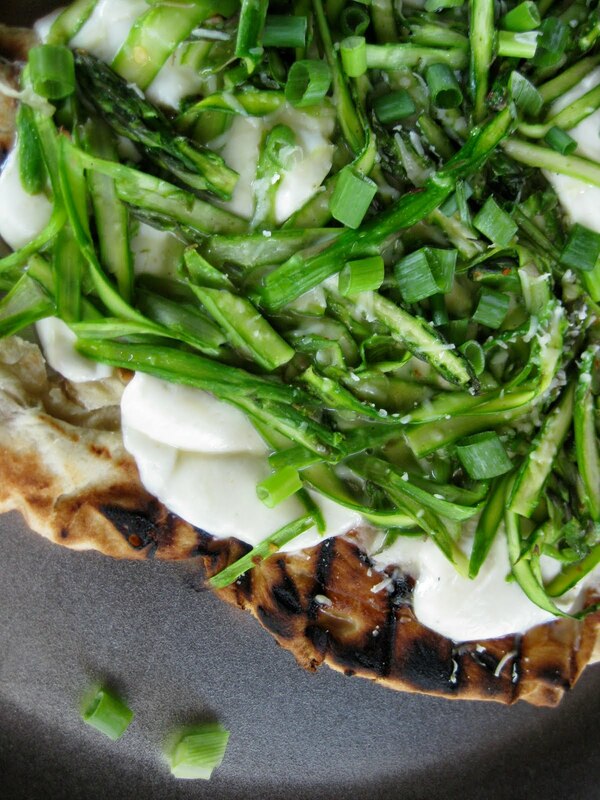 Shaved Asparagus Pizza. This was our first shot and where we learned what not to do. The shaved asparagus topping was delicious. Really good with the two cheeses, fresh mozzarella and parmesan. It was such a nice summer pizza. Red Onion Marmalade Pizza. This red onion marmalade is worth my life in coins. I could just eat it as is. Favorite! Favorite! The salty prosciutto and creamy ricotta cheese add nice balance to the sweet marmalade. The onions are so good, it really doesn't matter what else is on here. I think the prosciutto is totally optional. And other cheeses would be great. Goat cheese. Mozzarella. Something really creamy. Or if you leave off the prosciutto, maybe add a salty cheese like feta or some parm. I am going to play around with it. Yummy! I wish we had a grill so I could make these! It is far too hot in our apartment for pizza, but I have been craving some so badly. And that onion marmalade sounds divine...I just adore onions. you have me drooling here - I've totally been craving pizza lately!